Avon Rent a Car Truck and Van > Blog > March For Her! Last weekend was the second annual Women’s March, which saw women gathering across the country to march for equality. While the marches all around the United States were inspirational, the one that took place in Los Angeles was particularly impressive and drew 500,000 participants. Such a large gathering of people dedicated to the same cause was empowering to participants who said they feel like revolution is happening now and it’s hard to disagree with them when similar marches also drew huge crowds across the country, from Washington D.C. to New York to southern cities like Nashville. 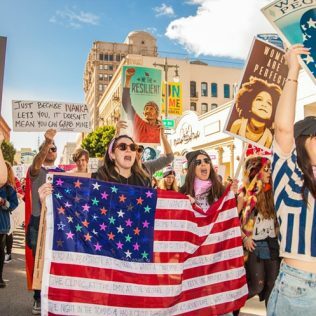 At the Los Angeles event, marchers were urged by guest speakers to run for office in order to enact policy changes for women and minorities. It’s easy to see how participants in the movements and marches could soon begin to be elected and enact real change. While there are ways to participate in the movements every day, in March of this year, a second women’s march will take place; this one will be for A Day Without a Woman, a day on which women are encouraged to stay home from work and refrain in economic activity in order to illustrate just how important women are to the country. It’s probably impossible to overstate their importance both in workplaces and on the country’s economy. You can join in for this March whether you’ve participated in the past or not. Bring a van load of your fellow, activist, friends, make some posters, and join the revolution. There is nothing greater than participating in this historical movement with your loved ones at your side! If you’re unable to make it out to the march in Los Angeles, there are some ways you can still participate from home. Try watching a live stream of the event so that you can catch all the empowering guest speakers and be sure to share articles and information on your social media. Engage with your friends in a polite discourse about the movements and just focus on getting the word out. Not everyone can be present for the march, but everyone can make an impact and just telling others about the beliefs of the movement is as important in showing up in person with banners and hats. You can also choose to donate to the marches and movements to help keep them going. However you choose to participate, be sure to show your gratitude to the hundreds of thousands marching on the front lines for all our rights.